The Jordana Easyshine Glossy Lip Color is the second new-to-me Jordana product I've tested, and it's another winner. 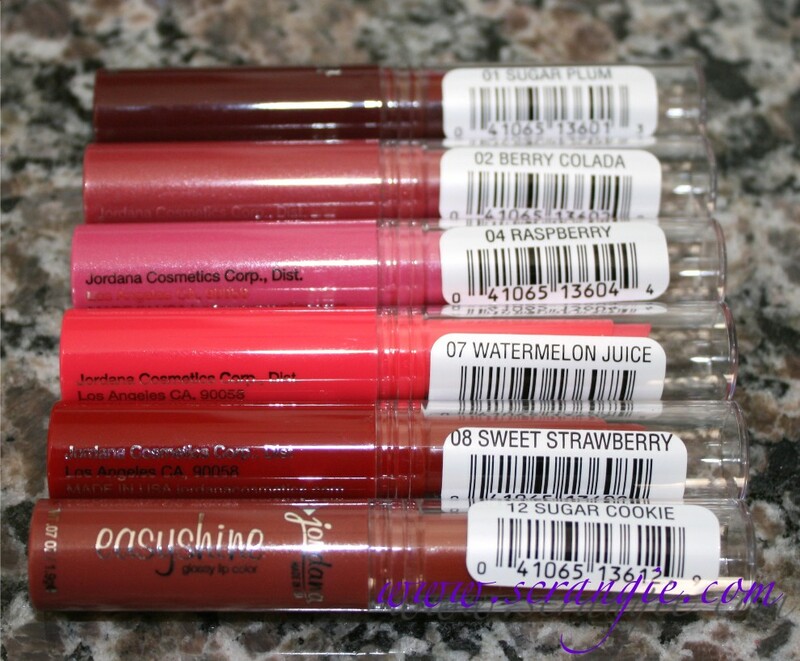 The first Jordana product I tried were the INCOLOR LipShine Glazes and I liked those, too. Let me walk you through the Easyshines. They're pretty nice. The Jordana EasyShine lip color is a solid, twist-up product, not a gloss. It's really more like a glossy lipstick or a colored balm. It comes in twelve shades, half of which I have here. 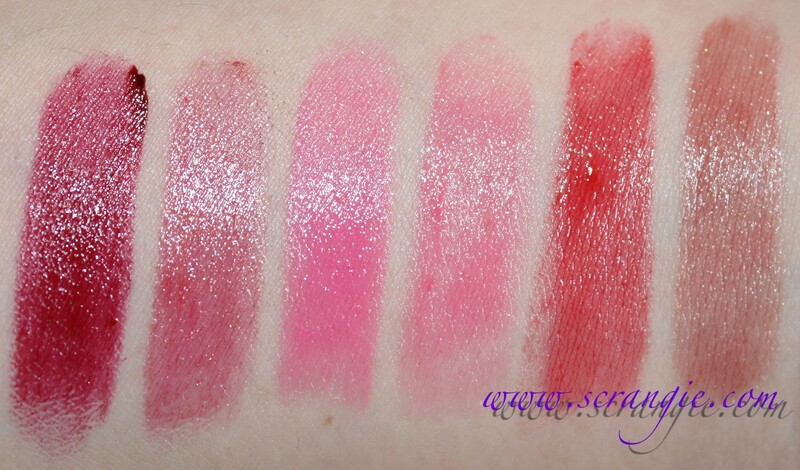 You can view the rest of the shades on Jordana's website. The shades are: 01 Sugar Plum, 02 Berry Colada, 04 Raspberry, 07 Watermelon Juice, 08 Sweet Strawberry, 12 Sugar Cookie. 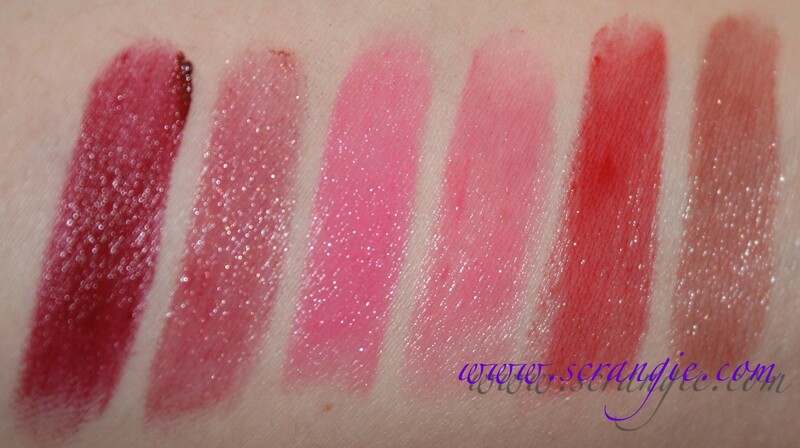 Left to right: Sugar Plum, Berry Colada, Raspberry, Watermelon Juice, Sweet Strawberry and Sugar Cookie. These are swiped a few times to show the color; they're a bit more sheer applied with only one coat. The texture of these is really nice. 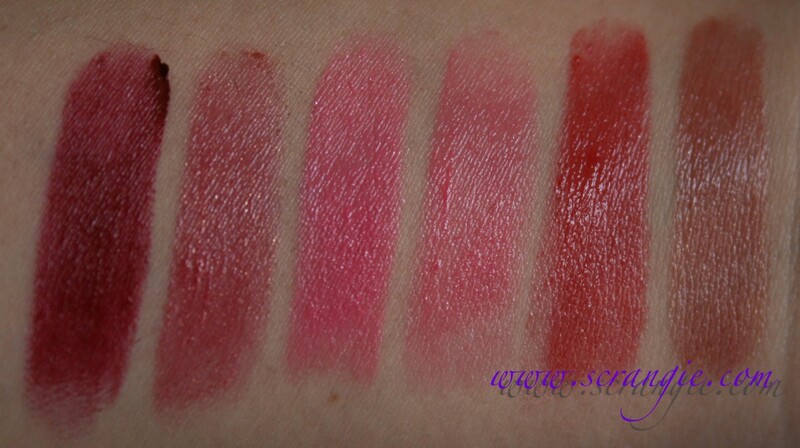 Instead of a heavy, drying lipstick texture, these have a light, melty, balmy texture. 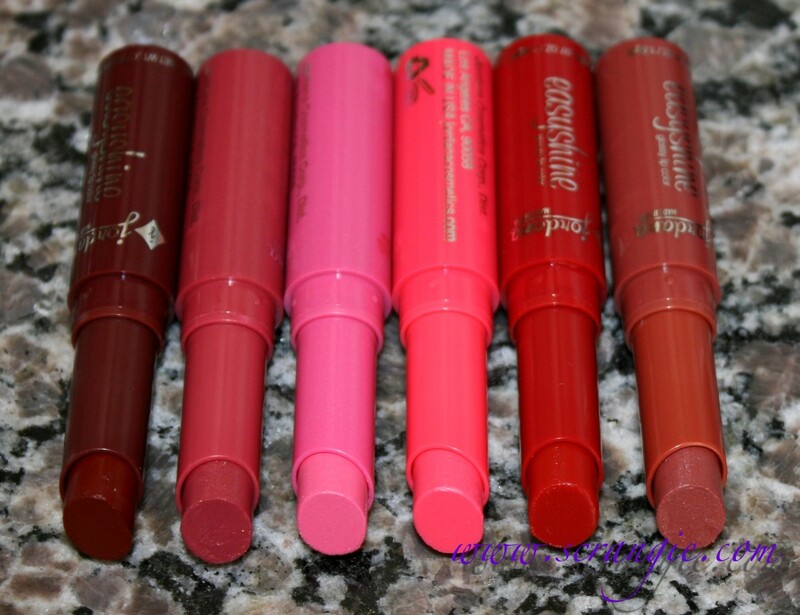 They feel really nice and smooth and also somewhat hydrating on the lips. They wear longer than the LipShine glosses, but still have a nice shine to them. Really, they're more tinted balm than they are lipstick. They add a nice wash of color, not too sheer, but not dense or opaque. Most of these are creme finish shades, but some have a very subtle shimmer. It's not sparkly or gritty or even particularly noticeable shimmer. The best thing about each of these is that they're scented and flavored. The scents correspond to the names; Sweet Strawberry is strawberry flavored, Raspberry is raspberry flavored, and so on. My favorite is, of course, Sugar Cookie, which has a creamy vanilla scent, but Berry Colada is surprisingly nice. I hate "berry" (what kind of berry is that, exactly?) scented or flavored anything so that was a shock. It smells good and fruity, not like puke and medicine like most generic "berry" things smell to me. Awesome scents and flavors, and they're all different. Yay! Nice amount of sheer, wearable color. Good amount of shine without being lipgloss shiny. They're inexpensive. At $1.99 each, you can buy the entire line of 12 shades for the price of one NARS lipgloss. The colors are natural and flattering. The packaging is pretty ugly and looks super cheap. I mean, these are cheap, but still... I wish the stickers weren't so huge and crooked. I do like that the tubes match the color of the product. I'm a sucker for matching packages, like the old Sally Hansen Hard as Nails bottles. The product doesn't twist down all the way when it's brand new. How they're pictured above is how they come; about a third of an inch of product exposed. Not so much of a flaw, just a general thing to be aware of so you don't damage the product while using it. They have a sort of... lipstick-esque aftertaste. There's not a whole lot of product in here; they're 0.07 oz. An average balm or lipstick contains around 0.12 oz. But they are only $2, so... not that big of a deal. For the price, I really like them. I adore scented/flavored things and these satisfy my want for scented things without making me spend too much. The shine is nice, they add a little color and they feel nice to wear. If I can find them at my Walgreens, I'm definitely going to pick up more of these. I have to have Mango Delight, Pink Lemonade and Brown Sugar! These colors look really great! These look interesting! I haven't seen these at my Walgreens, but I'll have to check for them online. Thanks! Berry Coloda and Watermelon Juice are the two I'd most likely want to buy. I will have to try these out! 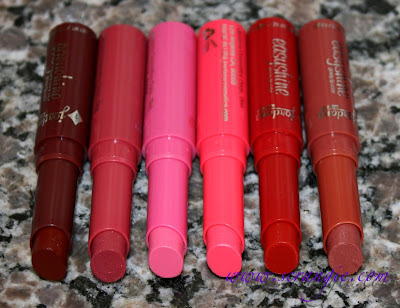 How do these compare to the Revlon Lip Butters? I love the crap out of the one I have, and these are cheaper, so I might have to get all of them! I've never used any of the makeup products. I just have a few of their polishes. For the price they're not bad a t all. I'll have to try these! I tried one of their lipglosses (don't remember the name of the line, just that they were all named things like LOL, BFF, XOXO, etc.) and it smelled and tasted like rubber. Thanks for taking the time to swatch all of these colours! :) WOW, Sugar Plum is the one I'm most excited about. 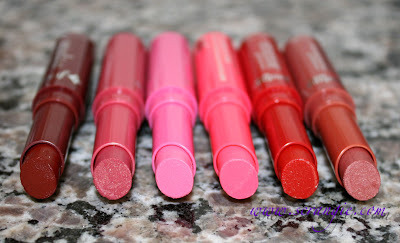 I'm also wondering how these compare to the Revlon Lip Butters. I haven't been able to try any Lip Butters, since they're only coming to Canada later. so they don't taste gross? like vaseline?